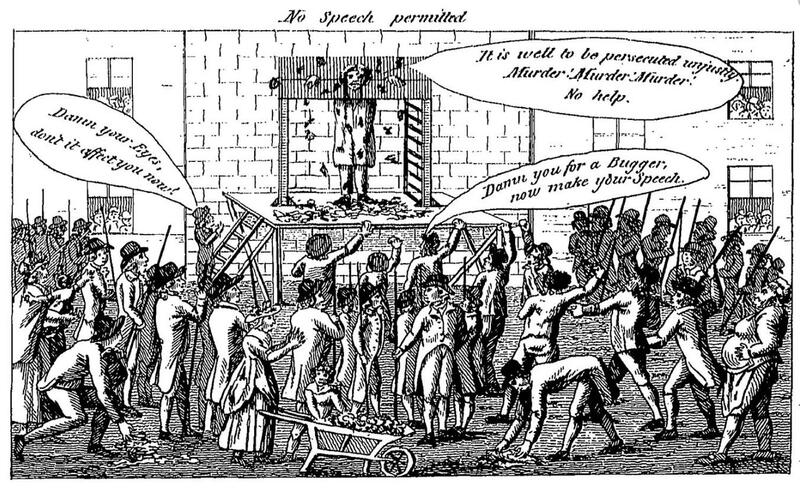 Although the concept of public punishment may now seem strange, even barbaric, it was the accepted norm until the 19th century. It is only in recent times that prison has been used as a punishment. Before the 19th century, jails were usually only places to hold people prior to their trial or punishment. 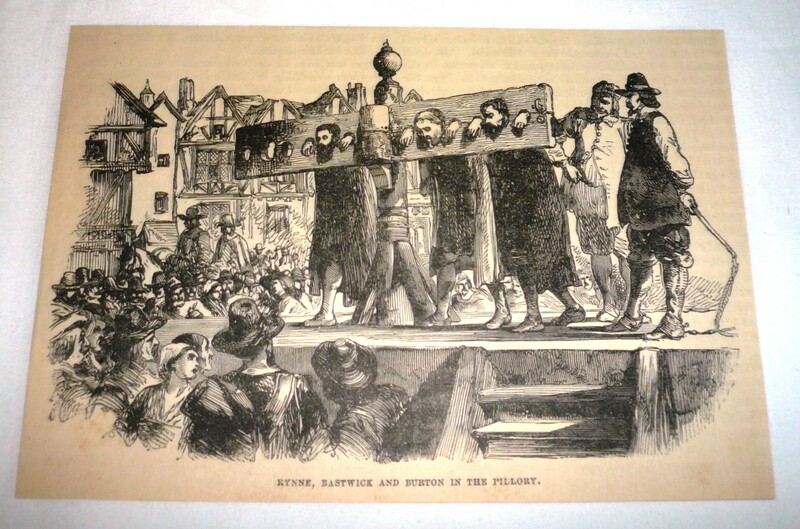 As an alternative (or in addition to) ear cropping, people in the pillory could be branded on the face. The nose could also be slit, or the tongue bored through with a red hot iron. In 1633, the author William Prynne was sentenced to life imprisonment and to stand in the pillory for publishing a pamphlet which had libelled the Queen. While in the pillory Prynne had his ears cut off, his nose slit, and his books were burned in front of him. A bystander later noted that they burned huge volumes under Prynne’s nose, which almost suffocated him. Prynne subsequently had his ears sewed back on, a most unusual occurrence. While in prison, Prynne published another pamphlet in 1637 which displeased the authorities. Back in the pillory, the unfortunate Prynne had the initials S.L. (Seditious Libel) branded on both his cheeks. He also lost his ears again, this time permanently. A pamphlet written by a Mr Savill (a linen draper in Margate, England) describes his experience of being pilloried in graphic detail. Mr Savill was arrested on 31 December 1799, having been accused by Sarah Bayly of sexually assaulting her six year old daughter. Although there was no evidence to support this accusation, the jury nevertheless found him guilty and the recorder passed this sentence: "To be imprisoned one calendar month, and within that time to stand in the Pillory in the Market Place, Dover". "...fixed up against the side of a building, facing the spectators (supposed to be between three and four thousand), and could not move round in the manner pillories commonly do. I was pelted at in a most shameful manner, and afterwards was informed that Mantell [Mayor of Dover] and King [Deputy Mayor] stood and laughed at the sight. I had no other reason but to believe that Mayor and King were determined that I should be murdered, if they could have done it genteelly, and afterwards brought it in accidental, having upwards of forty constables under a kind cloak of deception. About eight or ten of the ignorant seafaring, and blackguard ruffians, who knew not what they were about, were admitted into the circle, close to the pillory, to pelt me with stones and all manner of filth; and one of the villains even came up and took the filth from under my feet several times, without any interruption by the magistrates or constables, when they might have been prevented with ease. I was used in such a manner, that I expected nothing but death; many of the spectators thinking the same, cried out open shame, and said that I should be a murdered man. One man, to a certainty, fainted away at the sight; others said it was worse than murder, and if the corporation wished to murder me, why did they not blow my brains out at once. My face and head were cut in a most shocking manner. The blood flow'd from my head and temples as though I had been stuck with a knife, through which I was quite blind of one eye for several days, and my friends who saw me did not expect my recovery. I cannot express bad enough the cruelty I experienced..."
This case does not appear to have been reported in any local or national newspapers, so we only have Mr Savill’s version of events. Nevertheless it is extremely rare to have an account written by anyone who had actually been pilloried. Last modified 7 June 2018.